Leucadendron coniferum is an upright shrub with a single stem. It grows up to four metres tall.The oblong- shaped leaves are slightly twisted and have a sharp tip.The leaves are 80 mm long and 9 mm wide. What are the flowers like? The cones turn red as they mature and later become green.They are kept on the shrub.The bracts are yellow. Plants flower during August and September. It has been found that Leucadendron coniferum is wind-pollinated. Seeds are kept in the female cones until after the next fire. It grows in neutral sand in fynbos that is rich in plants from the Protea family. It grows on the Agulhas Plain, in coastal areas of the Cape Peninsula, and around Betty’s Bay. It is used as a filler in bouquets. 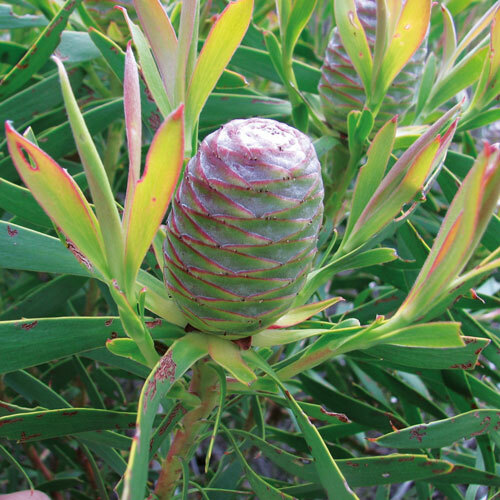 Leucadendron coniferum is threatened by invasive alien trees, degradation, loss of habitat, pollution and unsustainable harvesting in certain instances. Sustainable Havesting Program. Copyright © 2019. A Flower Valley Conservation Trust Initiative.